"Will Scarlet is good at two things: stealing from the rich and keeping secrets - skills that are in high demand in Robin Hood's band of thieves, who protect the people of Nottingham from the evil sheriff. Scarlet's biggest secret of all is one only Robin and his men know...that she is posing as a thief; that the slip of a boy who is fast with sharp knives is really a girl. The terrible events in her past that led Scarlet to hide her real identity are in danger of being exposed when the thief taker Lord Gisbourne arrives in town to rid Nottingham of the Hood and his men once and for all. As Gisbourne closes in and puts innocent lives at risk, Scarlet must decide how much the people of Nottingham mean to her, especially John Little, a flirtatious fellow outlaw, and Robin, whose quick smiles have the rare power to unsettle her. There is real honor among these thieves and so much more - making this a fight worth dying for." (Lovely rhyme there, by the way). I enjoyed Scarlet, a work of YA historical fiction and romance. The plot conceit of a girl dressed as a boy is a very good one, and it was done pretty well in Scarlet. I didn't always love the ungrammatical writing style; it felt inconsistent and kind of unrealistic. Still, there were great details and language. As Scarlet would say, it were a pretty good book, although probably historically very inaccurate. I enjoyed both the characters of Robin and Scarlet; they felt like real people (with chemistry) as opposed to glorified idols. I find the story of Robin Hood really fascinating. Scarlet was a bit annoying at the beginning though, with her stubborn insistence on not eating or taking orders or accepting help from anyone. She's angry when Robin wants her to take someone else with her when going to a prison to help someone escape. I suppose it would be infuriating to be offered help just because you're a girl, but that's not why Robin does it; it's because he wants to make sure she's all right. And also, because sneaking into a prison is, you know, hard. The writing was totally unremarkable, but as the book went on, it started to pick up. The story itself is very good, as is the adventure. The quiet moments were interesting too. Scarlet gives more detail into how the band actually lives: where they sleep, eat, etc. Obviously, the story differs vastly from the traditional tale, as there's no obvious Maid Marian (although that's part of the easily-guessed secret). But I still liked the way it was told, and as the book went on, I got used to the somewhat odd writing style. The book wasn't a really fast read, but it didn't take that long to read either, with lots of action (though not quite as much as I would have liked), dialogue, and not a whole lot of description. The romance with John Little served no other purpose than to make Robin jealous, as far as I could see. That part was definitely annoying, and I wish Scarlet would have been a bit firmer in her feelings. At first, it wasn't too bad, but as the book went on, this part of the novel annoyed me more and more; a lot of the parts with John could have probably been cut out, and the book would have been better for it. Of course, they all have much more important things to worry about, her particularly, what with Gisbourne in town and determined to catch them. Scarlet's dark, secret past was pretty easy to figure outt, especially given the original Robin Hood tale; before she joined Robin's band, she was in London with someone named "Joanna", and throughout the book, bad things relating to Gisbourne that happened to them are hinted at. It's not revealed for quite a while, though, and there were a lot of details that I really wanted to know earlier. Still, the mystery aspect was part of the novel, and woven in pretty nicely. 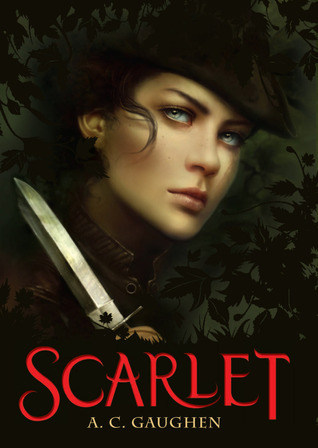 Scarlet was a good but not great YA historical fiction retelling of the classic myth. Its half love triangle thing (I'm not sure what to call it) was not good, and the writing wasn't amazing, but other than that it was well-paced and plotted, and I liked it. Rating: 3.5 stars. (between good and really good).